Again, I've copied out the recipe and it can be found at the end of the post. Miso softened in dashi, straining through a sieve. First, I prepped the potatoes and tried to cut them in nice shapes, making up what I think would conform to the Japanese aesthetic. Making up, because I have no clue. Oh, we used mostly yukon golds, then threw in a couple or so of nugget potatoes. While that was going on, I added a little bit of dashi to some miso and strained the mixture. As you know, I share the same lazy mind as TS and proceeded to voice out numerous objections to the many specific and seemingly endless instructions the recipe contained. 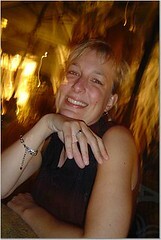 Isn't it strange that my lazy mind didn't come with a lazily silent mouth? Unfortunately, my lazy mind only came with a lazy bottom -- hence, I didn't lift my seat out of my comfy chair while TS was preparing this dish. 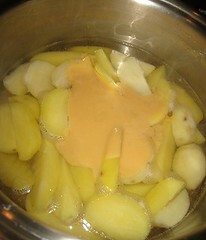 To start the simmering, I placed the parboiled potatoes in some dashi. This had to be cooked first without the miso yet(!). That is, the pot was brought up to temperature first, from cold to simmering. 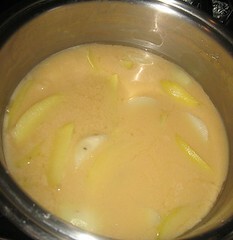 Then, the strained miso mixture was added and mixed in. 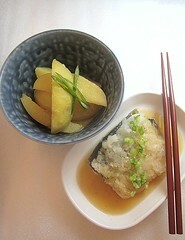 Traditionally, a wooden drop-lid (otoshi-buta) is used. I don't have that, so I took the suggestion of making a parchment paper lid with a vent in the middle. I placed the lid and simmered the potatoes for about 20 minutes. The dish was done. Oh yes, the recipe called for blanching 4 pods of okra and using cut rounds as garnish. Finally, my Lazy Mind revolted! We actually had all the main ingredients for the dish on hand, so I definitely didn't want to go out and buy 4 pods of okra! So, no okra rounds for garnish. Sorry. 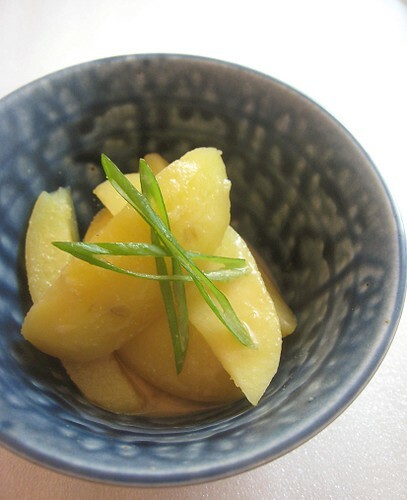 The recipe called for using a slotted spoon to place 5 pieces of potato in a deep individual dish per serving, then spooning over a few tablespoons of the miso liquid. I told you, very specific instructions. So, I found this deep Japanese bowl. For garnish, I placed a few slices of green onion with a restrained hand. Well, I did just that. I made one individual serving for the photo, then served the rest in one big dish. At this point, another aspect of my mind came forward. When all was said and done, even Lazy Mind had to agree that these were absolutely delicious. I guess when great care is taken to prepare such simple ingredients, great things can result. Who would've thunk it. The entire potato's being had been infused with miso. The texture of the potato was light, smooth, yet creamy. It was satisfying but not heavy. "It was subtle... yet profound." I'll be darned, because these potatoes tasted quite unlike other potatoes I've ever had before. I don't think I've had potatoes this smooth and -- for lack of a better term --harmonious. It was potato to the power of potato. Certainly, biting into the potato, one can taste the miso but it seems that the miso also highlighted the very essence of the potato. In short, I have never tasted a potato tasting so very like a potato -- and gosh darn it! I really, really, really do love potatoes. Nope, this still isn't our Regional Recipes entry. Peel potatoes and cut into quarters (into 6ths, if large Idaho potatoes). Parboil in slightly salted water until tender but not flaky, then drain well. 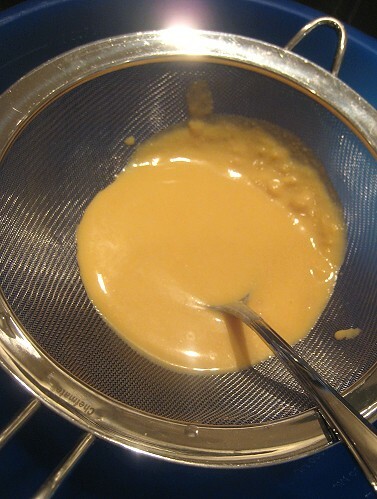 In 1/2 cup of the dashi, soften the miso and strain through a sieve. 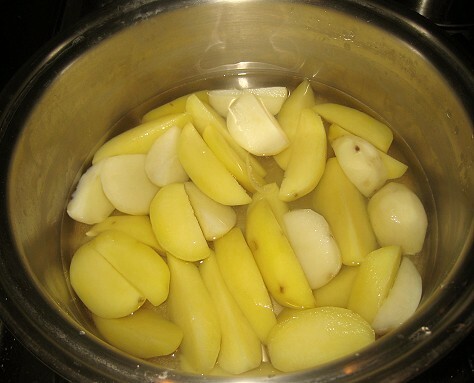 Into a medium-sized pot, put the remaining 1 1/2 cups dashi and the parboiled potatoes. Heat over medium heat until simmering. Add the strained, softened miso. Mix. 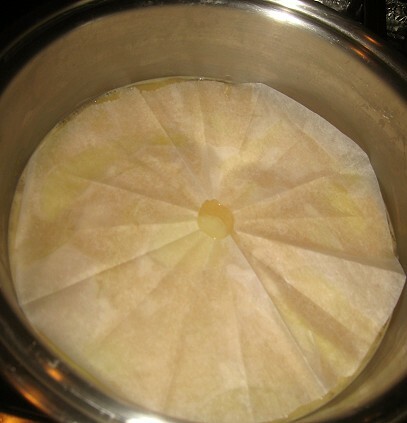 Cover with a drop-lid (otoshi-buta) or circle of baking paper with a vent and simmer or *gently* boil for 20 minutes. To serve, use a slotted spoon to transfer portions (5 potato pieces per serving) to deep individual dishes, then top with a few Tbsps pf the hot miso liquid. Garnish with okra rounds (or substitute) and serve immediately. Sherli Hon Dory is submitting this to Potato Ho-Down, hosted this month by Baking Delights. The round-up should appear sometime after November 19. Never would have thought to do this, but now will have to as it looks and sounds so good. I agree with Peabody! And you did a great job with the aesthetic. I also have this cookbook but have yet to make a recipe from it... You've inspired me! 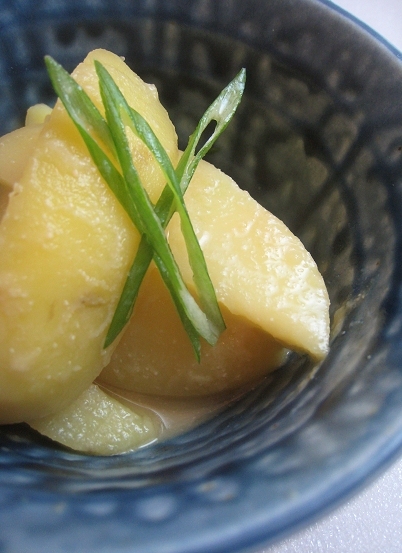 Love the idea of miso with potatoes. I'll bet these were delicious. This looks great. I've never seen potatoes prepared this way. This is just delightful, I love miso and wow...this is just awesome. Gluttonous Mind: "One serving is ONLY five pieces?!" LOL that looks so good, my mind thought the same thing! I can probably eat five servings, not 5 pieces. Great job! In my opinion, the simplest recipes are always the best. I think I'll be making these today. I adore miso (white is my favorite) and I love potatoes, so I'm ALL OVER THIS. I never would have thought of putting them together either. GREAT idea!!! This was also the first time we've actually cooked anything from the cookbook. Things seem so "complicated"... or at least, the recipes, if not the actual dishes. Oh yeah. Lazy Mind always wins. I had to tie my Lazy Mind up and hold it captive while I made the dish. Go unite your two loves, potato & miso! JS may have a knack for that. We've resigned to the fact that everyboyd in the world doesn't eat a lot... except us. Teehee. Maybe we *will* take the credit! I too have a hidden personality called "lazy mind". Although, I've come to learn my lesson with Japanese food and generally stick to the directions. I'm always looking for new ways to do up potatoes. So simple an ingredient, yet always manages to leave me wondering what to do with it. Thanks for the recipe. I bet this was absolutely delicious. I love potatoes and the way they absorb and retain whatever flavours they're cooking in. I always add them to my Thai curries. Kudos to you for seeing this through to the end! My laazy mind woudl have won out ages ago and I'm sure the finished product would have suffered. As it is, it sounds wonderful! This is a great way to cook potatoes. Thanks for the recipe. Haha, glad to know Lazy Mind doesn't just reside in our minds. Ah yes, potatoes in curry are fantabulous! I too, would probably eat more than five pieces! And that photograph of the dish is absolutely beautiful. Yum, I love potatoes no matter how you make them. I also love miso. This looks wonderful and I'm sure it tastes as good as it looks!